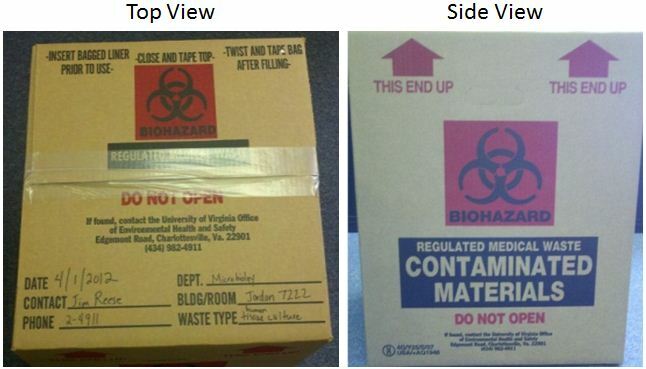 * Note that biotoxin waste SHOULD NOT be labeled with the Biohazard label as it is hazardous chemical waste; EHS Biosafety and Hazardous Waste personnel collaborate to provide guidance on the inactivation (e.g., autoclaving or chemical) of toxins. See Biotoxins for more detail. **Waste placed in sharps containers do not require inactivation prior to disposal. Specific Requirements for Decontamination by Autoclaving are provided in the IBC’s Policy on Autoclaving. Recommended "Autoclaving Safely" training is provided courtesy of EHS Biosafety and is available online here Log-in. 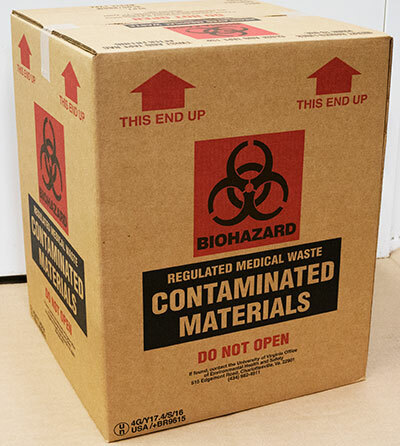 Solid biohazardous waste may be disposed of directly into a Contaminated Materials Container (CMC) where it will be removed by EHS or licensed waste contractor. These containers must be lined with a red bag. Once a CMC is full, the top must be taped closed and properly labeled with the generator's name, building, room number, phone extension, date and waste type (e.g., cell culture). -EHS provides 4 cu. ft. CMCs and bags for all research laboratories free of charge. -Rooms will be stocked weekly to promote responsible consumption of supplies. -Housekeepers will pick up the CMCs (taping and labeling remain the same). -Weight limit of 30 lbs. (do not overfill, see below). If your CMC is improperly prepared or too heavy, Housekeepers will notify you by placing the following pink label on the box. Gilmer, Chemistry & Other Academic buildings (outside the Medical Center) - use this online form Log-in or call EHS at 434-982-4911, to schedule the pick up of RMW waste and delivery of empty containers. West Complex/Multistory: Research labs in the Multistory or Old Medical School Building are provided red step-on containers and sharps containers. Regulated Medical Waste is picked up (both red bags and sharps containers) by Hospital Environmental Services housekeepers. If you have questions, please contact Hospital Environmental Services at 924-5162. The table below is designed to aid you in determining how to collect, decontaminate, and/or dispose of your waste. BSL-2 indicates biohazardous or regulated RMW waste and BSL-1 indicates "other" biological waste not known to be pathogenic or regulated. * Animal carcasses or wastes that contain hazardous chemicals must be handled as indicated in the ACUC protocol. For general information on carcass disposal see this ACUC policy. Radioactive animal carcasses and associated wastes must be labeled (radioactive warning tape) and collected by EHS Radiation Safety. For more information on radioactive animal carcasses click here. Human cadavers and recognizable human body parts require special handling. Please contact EHS Biosafety at 434-982-4911 for guidance. For hospital-like waste not used in research (e.g., for patient care), please refer to the Medical Center's "Where Does all that Garbage Go" poster for appropriate disposal. If they DO NOT contain or ARE NOT contaminated with Radioactive Material (any amount), Chemicals (more than a trace amount) or Biohazardous Material (any amount), then these waste materials are Waste Laboratory Glassware (WLG). For CMC operations and pick up issues, contact Derek Snapp at dcs7e@virginia.edu or 434-982-4911. Regulatory questions, contact Ericka Pearce at eep3p@virginia.edu or 434-982-4911.